I have a Cheyenne. I love it except for the fact that 95% of the time I am smoking with the fire door open in order to keep my fire alive. I've watched all of the videos, I am using seasoned wood. I want to cook 225-250 but end up having to cook from 250-275 since I cant really burn anything with the door closed. I start with a chimney full of oak lump. I then toss it onto the grate. Usually start with 2 pieces of hickory, I have been buying the bags of hickory splits at Home Depot since in Southern California it's very hard to come by. I do have some oak but it's too large, Im going to have to get a saw to use it. So I let the logs catch, close the top. Leave the fire door open for a bit, usually I start to close it a few inches every 5 minutes until the door is closed then I back down the temp. Usually when I first start, I can keep the white smoke away since I let most of that happen before the logs catch. So usually I'll get the door shut and it will be around 230 or so with the vent 3/4 open. It's great ! I leave it for 45 or so until it gets down to 205. This is where the fun ends. I stick a couple of splits on top of the firebox to heat them up. So I open the firedoor and toss them in. Usually I have to open the top of the firebox too in order to keep the white smoke out of the cook chamber. So it catches, seems healthy, so I close the top of the firebox and do the same as I did before but this time, even starting to close the door partially, I start to get smoldering. Even after 15 minutes of fiddling with the thing when I think at least by now everything is caught, closing the door, white smoke within a minute. So I end up having to baby the thing and ultimately leaving the back door open until I need more wood. What am I doing wrong? The wood is dry as can be, and when I put it in, after being on the firebox, its too hot to touch for very long so I use tongs. I tried the method shown here on video, keeping fire on one side and a split on the other. Trouble with this was for me burning one split at a time, I hardly ever had enough coals after 1 log to keep my temps up for another one. Yes as I said, I've seen the video and its very hard to keep a bed of coals with one split at a time in the firebox on the Cheyenne. Also whenever I put splits in there to warm, they eventually start to smolder and smoke up the grill before it's time for them to go on. I don't own his smoker but keeping the fire back from the door seems to be key. You could have wet wood. Conumdrum wrote: I don't own his smoker but keeping the fire back from the door seems to be key. You could have wet wood. Wood is super dry, its seasoned. I honestly think this smaller firebox doesnt react the way the larger smokers do. Literally I've tried everything, if someone makes a video just like the one everyone posts with a Cheyenne I guarantee you will not get the same results. I've tried several types of seasoned dry wood too. WITH drafts and WITHOUT. No difference in reaction. The only way I can get wood to burn without smoldering is with the door open and I am losing a lot of heat and gas by doing that. Im pretty disappointed. Other than the thick steel and nice vent and grates, this thing holds a fire about as good as my OK Joe from Home Depot. We have developed a modified damper for the firebox that we should complete with testing sometime next week. We received your email in Yoder Support and will be in touch once we get this completed. Sorry that you are experiencing issues with your cooker. 1. What is this this modification that you are currently testing? How is the damper different from standard? 2. Which Yoder cookers is is suitable for? 3. What does the modification aim to improve? 4. Are you considering making it broadly available to your customers, and if so what is the estomated cost? 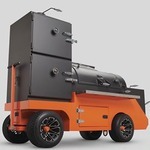 The most important thing in managing the fire in a Yoder Smokers offset is the placement of the fire inside the firebox. It is immediately assumed that the fuel needs to be placed directly in the center of the fire grate. While this may be true for some offset smokers, a small hot fire in the back right corner of the firebox has been very manageable and very predictable to cook with. A split every 45 minutes or so and it just chugs right along.. The picture above shows where we place the fuel to achieve the best experience possible. 1. Place your charcoal onto the wood grate in the back right corner near the side door and ignite the coals. Once this is done you can close the side door. NOTE: We do not recommend using lighter fluid to ignite the charcoal. 2. Once you have a hot bed of coals, close the damper to the halfway position. You are now ready to cook. Place the flavor wood of your choosing directly onto the hot bed of coals and close the main firebox door. NOTE: Pre heated, debarked wood works best to minimize white smoke. You can preheat the next piece of wood by placing it on top of the firebox door. 3. At this time, you will adjust the firebox damper and smoke stack to control the temperatures inside the chamber of your Yoder offset. Same problem here. It’s very tedious tending the fire with the Cheyenne. Door usually has to be wide open to get clean smoke. potatoesandpalmtrees wrote: Same problem here. It’s very tedious tending the fire with the Cheyenne. Door usually has to be wide open to get clean smoke. If you can not close the door and manage the fire via the door damper, your fire needs to be smaller. Also, with the smaller cookers, you need too keep the ash cleaned out from under the fire grate to allow for airflow. Use the ash rake that came with your cooker to pull the ashes from under the grate into a metal bucket. Thanks for the reply, You mention a smaller fire, any specifics on that? I usually start with one load of briquettes from a charcoal chimney than about a 6 in split on top. For the Cheyenne, I would suggest half a chimney of charcoal and a beer can sized split 12" long to start. The idea is that the cooker was designed to function with a very small hot fire, so finding the size required is up to you, based on the fuel that you are using, With a properly sized fire, the fire management will be done simply with the door damper and fine tuning the chimney damper. You can have as big as a fire as you want, but you may need to keep the door open to allow the amount of oxygen into the cooker required to keep the fire burning clean. You may need to scrape the ash out from underneath the fire grate with the ash tool when adding wood, to allow for proper air flow. Use a metal bucket under the firebox and use the ash tool to pull the ashes from under the fire grate into the bucket when adding wood. The wood pits are all made of heavy steel, and require time to heat up and normalize. This might possibly take up to an hour. Our pellet cookers can take 30 minutes or more to heat up the metal mass and normalize. This caught my eye: "the bags of hickory splits at Home Depot". I have a Wichita and the hickory split logs from the bag at Home Depot simply don't burn right. They are crap and smolder and are junk. I have used some Kiln-dried bundled hickory from a local guy and it works great. I have no idea what is wrong with the bagged hickory logs from HD but I have experienced exactly what you described with them. Switched to better Kiln-dried logs and it performed just like the video.